✔ PERFECT SPOT FOR RESTING AND GUARDING FOOD ---- To watch the lovely hummingbird, place the swing next to a feeder or a nectar-rich flowering plant. This will serve as their perfect perching spot. Hummingbirds are very territorial and will use the swing to guard over their food source. ✔ ATTRACTIVE COLORFUL BEADS --- These fancy colorful beads go in complete sync with the vibrant texture of the hummingbirds. The red, blue, pink, orange, yellow and green colors will attract the smallest avian species from far. Hummingbirds are known to have sharp eyesight which attracts them to this little swing. 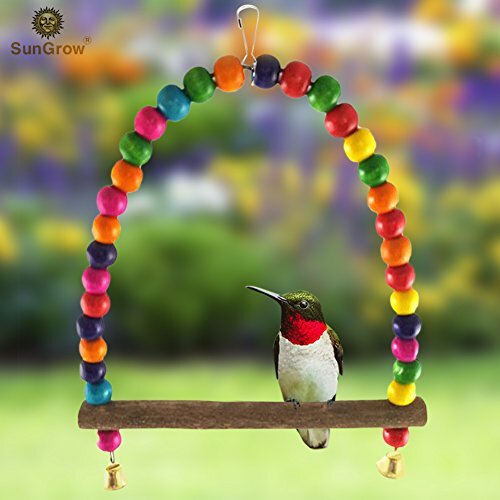 ✔ ADD VARIETY AND COLOR TO YOUR "GREEN GARDEN" --- Since this hummingbird swing perch from SunGrow comes with a metal hook at the top, you can easily hang it in your garden to give a bright accent. Alternatively, hang it from a branch or even inside a birdcage. The options are plenty, you just have to choose. ✔ NATURAL WOODEN PERCH --- The little perch or dowel is made from natural wood. Hummingbirds will love the feel and texture of the rod. Their little claws can easily grip onto the wood facilitating their beak exercise. ✔ HUMMINGBIRDS LOVE TO SWING --- Research says that hummingbirds spend about 80% of their time perching, and these tiny birds will constantly be using this perch to swing back and forth on.